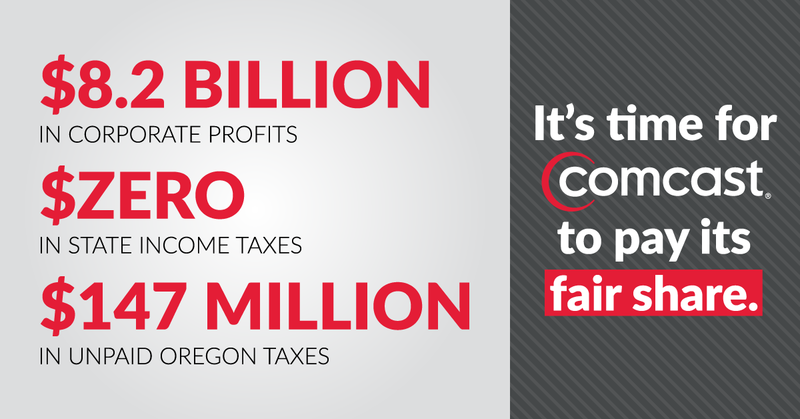 For years, Comcast has used every trick in the book to get out of paying its fair share in Oregon taxes. From censoring ads to spending nearly half a million dollars against corporate accountability, Comcast will seemingly stop at nothing to shift its tax burden onto the backs of hardworking families. Comcast already gets a nearly free ride here in Oregon. In 2009, Comcast paid absolutely nothing — zero dollars — in state taxes. In fact, its tax rate was negative 3.1%, meaning that Comcast was essentially paid $156 million just to file their state taxes that year. While most of us would be ecstatic to receive that sort of return just for filing our taxes, that’s not enough for Comcast. For years, Comcast got away with paying exceptionally low property taxes because the company claimed it did not provide a “communication service” subject to Oregon’s central assessment method of assessing taxes. If you’re saying to yourself ‘Wait — doesn’t Comcast exclusively provide a communication service?’ then you’d be right. (In fact, Comcast itself admitted that it was a communication service when doing so would allow it to avoid paying tens of millions of dollars every year.) In 2009, the Oregon Department of Revenue (DOR) agreed that Comcast was in fact a communication service provider — its internet access and cable TV services fit the bill to a T — and the company was required to begin paying its fair share of taxes. But Comcast wasn’t having that, and the fight has continued for eight years. Today, Comcast owes the state $147 million for its tax tricks, and the company is showing no signs of paying up. That’s because there’s little incentive to: Under current property tax law, companies can hold onto the money they owe until all legal issues are resolved. In effect, it’s a no-interest loan, just because Comcast avoided paying its fair share for years. Now we have the opportunity to end that. Last month, a bill that would close this loophole passed the Oregon House. HB 2407 would make companies pay interest on large tax obligations that they challenge. Today, the Senate Finance Committee will hold a public hearing on the bill. While HB 2407 won’t fix Oregon’s chronically low corporate taxes, it’s a big step towards holding corporations accountable for their fair share.